If any of my students are reading this, please stop, lest you think your current or former English teacher is a hypocrite, as I’m about to make a claim with very little–possibly no–evidence to support it. Based on his public statements and actions, Brian Cashman intends to sign Bryce Harper to the New York Yankees. Going by Cashman’s public statements, this doesn’t make any sense. Last week at the Winter Meetings, Cashman essentially declared the Yankees out on Harper, ostensibly thanks to their very full outfield. With spots taken up by Aaron Judge, Aaron Hicks, Giancarlo Stanton, Brett Gardner, Jacoby Ellsbury, and Clint Frazier, there’s just not room for another outfielder, even one as talented as Harper. That sentiment is true if we take Cash’s words at face value, but digging a bit deeper–not even that deep, really–might reveal this as posturing. The Yankees and Cashman gain nothing by openly stating their desire to sign Harper. And while I question how effective negotiating through the media is in today’s age of baseball with almost every front office thinking and acting the same way, it’s not something many GMs or heads of baseball ops are going to do. Beyond that, does anyone really believe that the Yankees are going to let three of those six players stand in the way of Bryce Harper? Gardner is a veteran leader and a ‘legacy’ player, who’s been a Yankee for life, but his days of starting probably should be numbered. On most contending teams, he’d be a backup. He and Harper are polar opposites at this point, with Gardner on the downside of his career and Harper just entering his age-based prime. Clint Frazier, despite his still massive upside and how much I want him to succeed with the Yankees, is coming off career-altering injuries and, as a relatively unproven player, should not stand in the way of one of the game’s best. As for Jacoby Ellsbury, well…he shouldn’t be a stumbling block for any player. The only question there is when, not if, the Yankees will develop the stomach to just eat his cost to get him off the team. With regards to actions, it’s the one Cashman hasn’t taken that hints hopefully towards Harper. In the last few weeks, there has been a lot of smoke around the Yankees and trade talks for pitchers. They’ve been liked to a pair of Cleveland starters–Corey Kluber and Trevor Bauer–as well as crosstown ‘rival,’ Noah Syndergaard. Presumably, third baseman Miguel Andujar would have been the centerpiece of any Yankee trade to bring high-quality pitching to the Bronx. As I write this, Andujar is still on the Yankees and none of those pitchers–or Manny Machado for that matter–are. With the caveat that anything can happen at any time, it seems the Yankees are committed to Andujar and are passing on Machado, even if Cashman’s language hasn’t been as strong in severing that connection as it has been regarding Harper. The Yankees are, arguably, more in need of a starting outfielder like Harper than they are a starting infielder like Machado. Ideally, the Yankees would go–and should go!–for both players and let the rest sort itself out, but I’ve more or less written that idea off. Given Cashman’s words and actions, it’s still possible the Yankees will end up with Bryce Harper. He is a difference maker in every sense of the word and pairing him with the right handed power of Judge and Stanton as well as the on-base ability of Hicks would make the Yankee lineup virtually unstoppable, able to outslug their (actually pretty good) rotation’s potential woes. 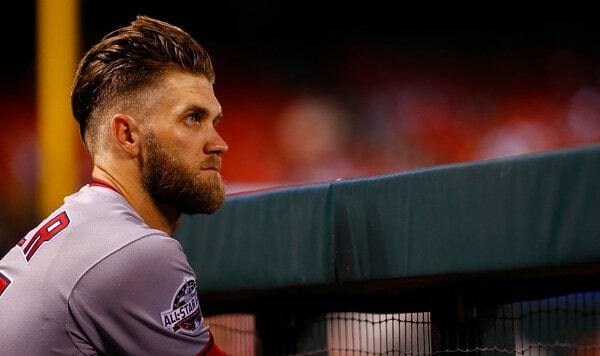 If the Yankees aren’t going to use their best trade piece to upgrade pitching and replace him with Machado, the most logical thing to do is sign Harper. All offseason long I sat here saying “I can’t see the Yankees going into 2018 with two rookie infielders.” Just didn’t seem like a thing the Yankees would do. And yet, the days kept ticking away, and eventually the Yankees went into Spring Training with two rookies penciled into the infield. Some combination of Miguel Andujar, Gleyber Torres, and Tyler Wade were poised to play second and third bases. That changed on February 20th. Two days after position players reported to Spring Training, the Yanks traded for Brandon Drury to play third base. Three weeks after that, they signed Neil Walker to play second. Those moves pushed Andujar and Torres to Triple-A and, honestly, it wasn’t the worst thing in the world. Andujar had to work on his defense and Torres was coming back from Tommy John surgery. As you know, Torres and Andujar wound up spending almost the entire 2018 season as the starters at second and third bases, respectively. In Andujar’s case, Drury suffered an injury early in the season, early enough that Andujar never did play a game for Triple-A Scranton. He was called back up before their season started. Drury’s injury gave Andujar his opportunity and wow did he run with it. In 606 plate appearances — only Giancarlo Stanton (705) and Brett Gardner (609) had more plate appearances among Yankees this year — the 23-year-old Andujar put up a .297/.328/.527 (128 wRC+) batting line with 47 doubles and 27 home runs. His walk rate (4.1%) and on-base percentage were much lower than you’d like, but a) Andujar was just a rookie, and b) Andujar made up for it by doing everything else so well at the plate. 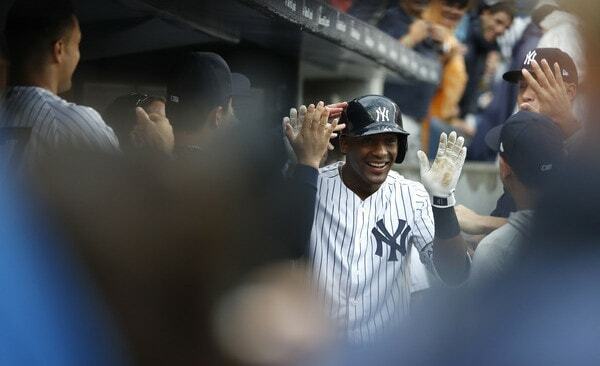 Despite not making the Opening Day roster, Andujar turned in a Rookie of the Year caliber season and was probably the team’s most consistent hitter from start to finish. He had his slumps, no doubt, but they didn’t seem to last all that long. If the Yankees had their way, Drury would’ve seized the third base job and run with it. Instead, Andujar took it from Drury and who knows where the Yankees would’ve been without him. Time to review his season. Andujar’s calling card throughout the minors was his innate ability to get the barrel on the ball. No matter where it was pitched, he could square it up. His breakout 2016 season featured a career high in doubles (26) and homers (12) with a 12.6% strikeout rate at High-A and Double-A. Last year Andujar had 36 doubles and 16 homers with a 13.6% strikeout rate at Double-A and Triple-A. He gets the bat on the ball and he hits it with authority. This season Andujar pounded 47 doubles and 27 homers with a 16.0% strikeout rate and a 9.6% swing and miss rate, both of which are quite a bit better than the league average (22.3% and 10.7%). Fourteen qualified hitters paired a .230 ISO with a sub-10.0% swing-and-miss rate this season, and they’re basically the 13 best hitters in baseball (Mookie Betts, Mike Trout, Christian Yelich, Jose Ramirez, etc.) and Miguel Andujar. There are not many dots in that chart around Andujar, meaning rookie hitters with a few swings and misses and lots of power. 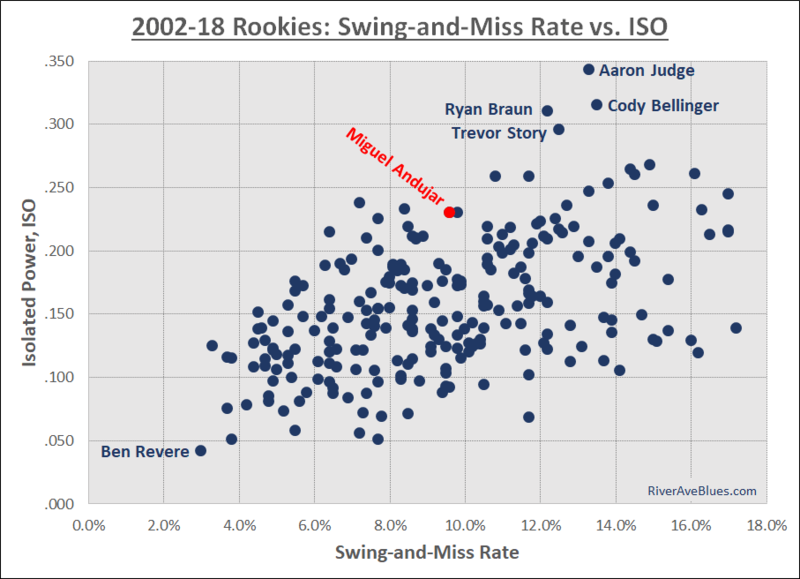 In fact, only two rookies since 2002 paired a lower swing-and-miss rate with a higher ISO than Andujar this year: Mike Trout (7.2% and .238) and Carlos Correa (8.4% and .233). Those two did it at age 20 and that’s far more impressive than Andujar doing it age 23. Among similar aged rookies, Andujar’s there with Nick Swisher and Evan Longoria (and Joey Votto!). Point is, not many players this season swung and missed as little as Andujar while providing as much power as Andujar, and even fewer rookies have done it this century. It’s one of those things you can’t teach. I couldn’t tell you how many times Andujar swung at a pitch out of the zone, I wondered to myself why in the hell he swung at that, and then watched it fall in for a hit. Remember his two-strike walk-off hit against the Indians?
? It just works, man. Pitchers adjusted too. They threw Andujar fewer fastballs and fewer pitches in the strike zone as the season progressed, and he slumped initially, but then he adjusted back and did better job laying off those pitches he couldn’t get to. It is a very unique skill set. Andujar makes contact like a slap-hitting speedster but he drives the ball like the power hitter, and he’s in control of his at-bats more than the walk rate would lead you to believe. In a lineup loaded with patient count-workers, this is a very different look. Johnny Frederick is the only rookie in baseball history to finish a season with more doubles than Andujar. (Frederick had 52 with the 1929 Dodgers.) Andujar broke Joe DiMaggio’s franchise rookie record for doubles (44) and keep in mind he did it in a home ballpark that isn’t conducive to doubles. Yankee Stadium is a home run ballpark. It is not a good doubles (or triples) park. Andujar still managed to tie Lynn’s AL record. Andujar is an impressive young hitter. He is not a good defensive third baseman, and it seemed he got worse as the season progressed, not better. Aaron Boone praised Andujar’s hard work and made sure to mention him whenever he had a good game in the field, but, when push came to shove in the postseason, Andujar was lifted for a defensive replacement in the sixth inning. I don’t think I’ve ever seen a player pulled for defense that early. Andujar’s defensively deficiencies are not due to a lack of work. I am not the most seasoned guy you’ll find but in my years as a BBWAA member I’ve never seen a player out on the field for defensive work more than Andujar. He’s on the field every afternoon with infield coach Carlos Mendoza and also occasionally Boone, a former big league third baseman, taking grounder after grounder after grounder. Andujar works on his defense. A lot. In the DRS era, very few third baseman had a season as poor defensively as Andujar this year, and those that did changed positions after no more than two more seasons at the hot corner. “Keep working on my routine. Don’t give up on it and the goal is to be more consistent overall,” said Andujar a few weeks ago when asked about working on his defense in the offseason. The Yankees have not yet said anything about Andujar’s defensive future and, truth be told, they may not have made a decision yet. It probably depends on their offseason moves, right? If the Yankees sign Manny Machado, they’ll need to start thinking about moving Andujar elsewhere. If they replace Didi Gregorius with a stopgap, they could continue to work with Andujar at third since he’ll probably be there for at least one more season. I weirdly have no firm opinion about Andujar’s defensive future. On one hand, he was so bad this season that a position change makes sense. I’d try the outfield before first base, personally. First base is sort of a last resort position. On the other hand, the kid is only 23! I’d hate to move him off a premium position after one terrible defensive season, a terrible defensive season that came as a rookie. Give him a chance to settle in, you know? If the Yankees move him, I’d be okay with. If they stuck with him at third, I’d be okay with it too. We’ll see. Andujar gets traded (for a starting pitcher, presumably). Andujar stays at third base in 2019. Andujar moves to another position in 2019. Right now, I’d rank those three outcomes (2) (3) (1) in order of likelihood. A trade does seem unlikely. Even though the Yankees need pitching, Andujar is a significant piece of the offense, and there is plenty of pitching in free agency. Moving him to another position? Okay, yeah, I could see it. Same with Andujar staying at third base. I expect Andujar to be in the starting lineup coming Opening Day 2019. At what position? That is TBD. Earlier tonight MLB and the BBWAA announced finalists for 2018’s major awards. 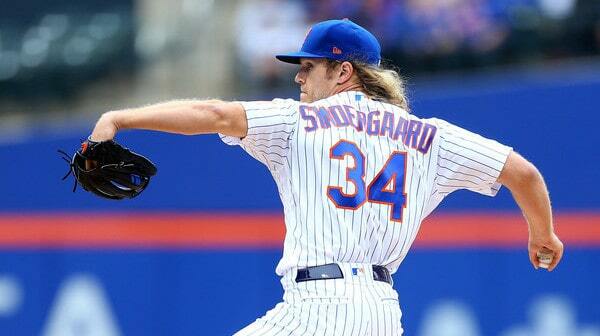 That is the Rookie of the Year, Manager of the Year, Cy Young, and Most Valuable Player. The league has been announcing three finalists for each award in each league for a few years now. They’re trying to drum up interest. As expected, both Miguel Andujar and Gleyber Torres are among the AL Rookie of the Year finalists. They’re up against Angels righty-slash-slugger Shohei Ohtani. Here are all the award finalists. The Yankees did not have any other finalists, which isn’t surprising. Having two Rookie of the Year finalists is pretty cool though. I am pretty sure Ohtani is going to win Rookie of the Year, folks. The guy hit .285/.361/.564 (152 wRC+) with 22 homers and threw 51.2 innings with a 3.31 ERA (3.57 FIP) and 29.9% strikeouts. That is straight up bonkers. And Ohtani did that while adjusting to a new league and a new country. He was incredible. I’d vote for him. Sorry, but it’s true. The last team with the first and second place finishers in the Rookie of the Year voting was the 2011 Braves with Craig Kimbrel and Freddie Freeman. The last AL team to do it was the 1984 Mariners with Alvin Davis and Mark Langston. The Yankees are guaranteed to have a top two finisher in the Rookie of the Year voting for the third straight season. Gary Sanchez was the runner-up in 2016 and Aaron Judge won the award last year. As for the other awards, it’s no surprise the Yankees did not have any finalists. Judge’s wrist injury took him out of the MVP race and Luis Severino’s second half fade took him out of the Cy Young race. Aaron Boone never had much of a chance in the Manager of the Year voting. Not with some of the other things that happened around the league. Next week is awards week. Manager of the Year will be announced on Monday, Rookie of the Year on Tuesday, Cy Young on Wednesday, and MVP on Thursday. They’ll all be revealed during a live MLB Network broadcast at 6pm ET. While Greg Bird’s year was essentially lost and Neil Walker’s was a roller coaster, things went just about as well as they could have for the Yankees’ youngest players, Gleyber Torres and Miguel Andujar. Both turned in stellar debut seasons and are likely to finish in the top 3 of AL Rookie of the Year voting, with each having a case to win the award outright. But as always in baseball, there’s room to grow for both players. At the plate, both flashed great power. 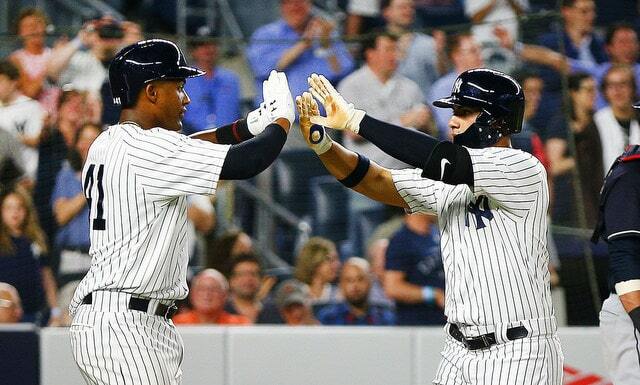 Andujar hit 27 home runs and Torres added 24, just three fewer despite having 122 fewer plate appearances. Both sported ISOs over .200, unsurprisingly, with Torres clocking in at .209 and Andujar at .230. That power wasn’t horribly surprising from Andjuar as he always had flashes of raw power that needed to–and did–turn into game power. From Torres, though, that was unexpected. With Torres’s power also came a relatively high strikeout rate of 25.2%. That high mark is offset by his power and his walk rate–8.7%–was respectable enough that you could live with those strikeouts. Given that this was a bit of a power outburst for Torres that wasn’t necessarily expected, we may see a drop from that in 2019. If that’s the case, he’ll likely need to cut down on those swings a bit and maybe be a hair more selective at the plate. It might be worth cutting down on outs, even if it means cutting down on power. 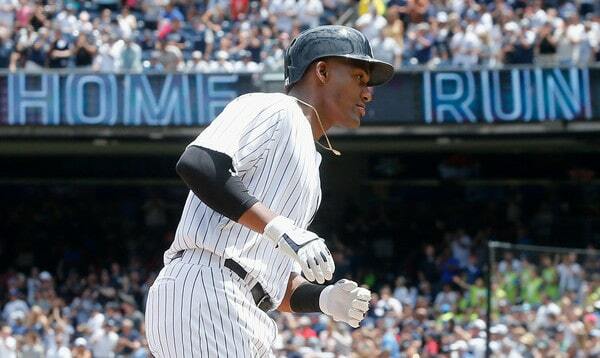 With Andujar, however, there’s no question that he needs to increase his selectivity and discipline at the plate. Despite high power and a low strikeout rate–16% exactly–a 4.1% walk rate probably isn’t going to cut it long-term, especially when the league makes adjustments to Andujar as a hitter. He’ll need to adjust to those adjustments, or pitchers will exploit his aggressiveness at the plate, which could lead to an increase in strikeout rate and a drop in productivity. Miggy has power to spare and cutting down for the sake of fewer outs will help both him and the team. The obvious place for both players to improve is in the field. FanGraphs rated their defense poorly, with Andujar clocking in at a 2005 Yankees-esque -15.5. Torres was “better” with a -7.2. Baseball Reference hit Miggy with a -2.2 dWAR, too, though they liked Torres’ defense at 0.5 dWAR. There’s no question that Andujar’s defense needs to get better or the Yankees will be forced to move him, whether to another position or to another team for a starting pitcher. I prefer the former. And even with that spread in Torres’ defense, he still could stand to get better. That proposition will be in the air as the Yankees adjust to Didi Gregorius’s impending absence. Will Torres get a chance to repeat at second or will they slide him back over to short? Given that they traded for Adeiny Hechavarria and had him play short when Didi was out at the end of the year, I imagine it’s likely that Torres stays at second. That’s probably good for his defensive outlook as he can continue becoming comfortable with that position at the highest level. Both Torres and Andujar had spectacular years in 2018. Were they to repeat them for the rest of their careers, they’d be among the best players in the league each year. However, there is still room for growth on both sides of the ball. It’s tempting to dream on what each could become with just a little improvement.